Unsharing yourself from an Innoslate project removes your permissions to access a project which has previously been shared with you. On the 'Manage Projects' page, click the 'Unshare yourself from this project' icon to the right of the project of which you wish to remove yourself. This will open up a yellow dialog box, confirming that you are sure you wish to be unshared from the selected project. If you are sure, click ‘Confirm Unshare’ to complete the process and return to your ‘Manage Projects’ page. 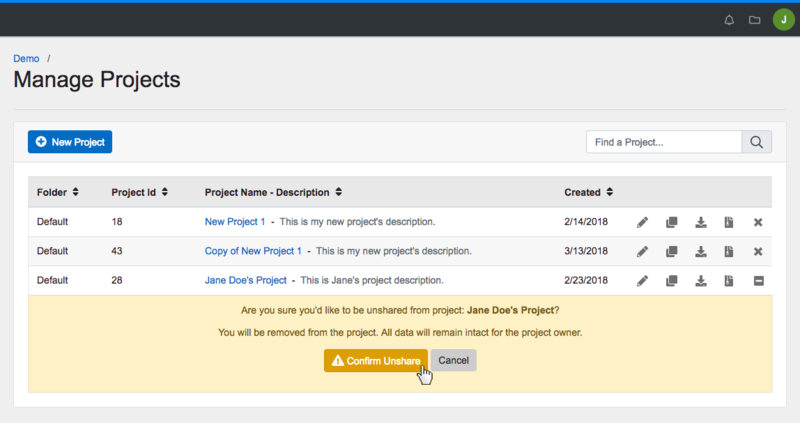 On the ‘Manage Projects‘ page, click the ‘Unshare yourself from this project’ icon to the right of the project of which you wish to remove yourself.